CO2 Carbonic Acid Feed System | JCI Industries Inc. Carbon dioxide gas is injected into an alkaline or near neutral pH water stream. The gas reacts with the water (H2O) in the side stream of water to form carbonic acid (H2CO3). TETRApHix® pH adjustment offers an efficient carbon dioxide dosing system . 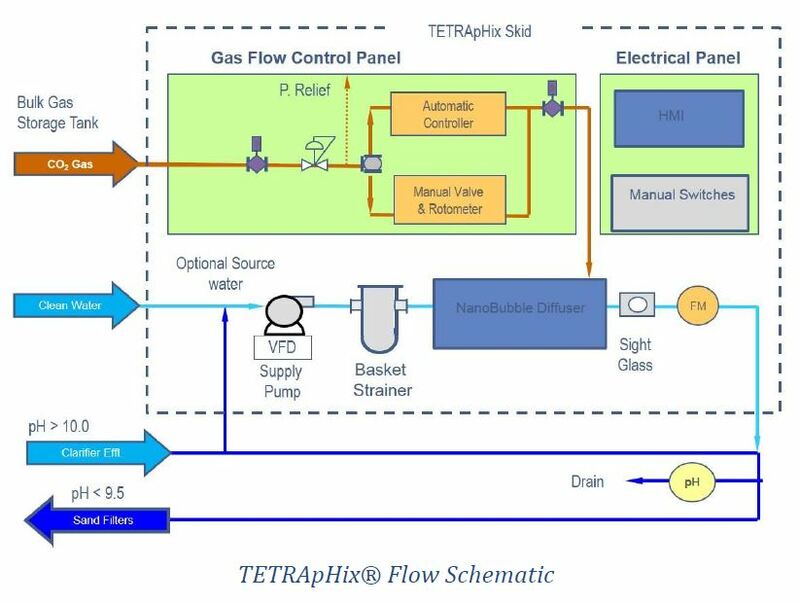 Unlike other carbon dioxide dosing systems, TETRApHix®is uniquely classified by the AWWA standards as a weak acid dosing system, allowing for more optimal plant process designs with reduced contact times. Being a weak acid system, gas/water reaction basins are able to be reduced or eliminated. The use of a NanoBubble Diffuser allows for an efficiency of over 99%. Gas loss to the atmosphere as a result of degassing of the main process water is significantly reduced, lowering annual O&M cost and making this technology more environmentally friendly. It also has one of the lowest mixing contact time of all gas dosing technologies which decreases system footprints. The skid mounted systems can be fitted with various size NanoBubble Diffuser units capable of delivering a wide range of carbon dioxide gas per unit. Multiple units can be combined per skid system for large scale operations and redundancy. The package unit contains all equipment required to be compatible with new or existing system. All systems are designed to suite the specific process needs and currently utilized in multiple industries including potable groundwater pH adjustment, beverage carbonation, surface water lime softening recarbonation and corrosion control, and inorganic removal water pretreatment. The gas & water interface used is based on a NanoBubble Diffuser module specifically designed with hundreds of porous hollow fiber strands. The strands allow gas to permeate through its walls and into the water, disbursing the gas into molecular sized bubbles which reacts immediately. The pores of the hollow fibers are designed to be the size of the carbon dioxide molecules, making the hollow fibers hydrophobic. The molecular sized bubbles react with the water faster than the larger sized bubbles produced from conventional spargers. With molecular bubbles created, increased gas surface area allows for increased reaction time, preventing degassing of the carbon dioxide, and increased efficiency. Each TETRApHix®system comes with its own control panels, manual over-ride switches and touch screen for local operation and reliability. 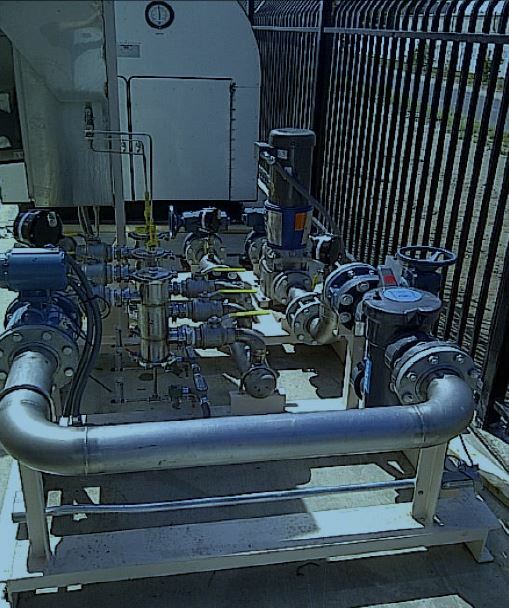 The system incorporates a centrifugal pump operated on a VFD to adjust the carrier water flow based upon the amount of gas required to be delivered. The NanoBubble Diffuser life is increased by pre-filtering out any debris such as sand or piping corrosion that may cause damage in existing or aging water feed piping. To increase gas dosage accuracy, the gas flow is regulated by a mass flow controller which flows an exact CO2 dosage calculated to generate the carbonic acid. This method of gas feed is much more efficient than standard control valves.